This page has information on fresh raw oysters, smoked oysters, chowders, serving suggestions, recipes, sizes, how to shuck oysters, how to steam oysters, and more. In coastal areas of North America, oysters are sold live in the shell or freshly shucked (meat only). Oysters are also available as canned products. The liquid that is recovered during the shucking process, known as oyster liquor, is an important ingredient in many recipes. Shucked oyster sizes are based upon the number of individual oysters within a given volume. The largest size of shucked oysters are called “counts”, followed by “extra selects”, “selects”, “standards”, and rarely “very small”. Oysters are sold raw in the shell in a number of ways. Many retail seafood markets offer oysters by the piece. Other measurements include by the dozen, peck, bushel or 100 lb bag. A bushel is a U.S. and imperial unit of dry volume, equivalent in each system to 4 pecks, 8 gallons, 32 quarts. 1 Imperial bushel = 2219.36 cubic inches. Sizes of raw oysters in the shell vary widely depending on species and location. A basic rule of thumb for most American oysters is that there are roughly 100 oysters per bushel; 25 per peck. A bushel of oysters will feed, on average, between 4 and 6 people. A bushel of oysters typically weights between 45-60 pounds. Oysters are typically served with white wine. 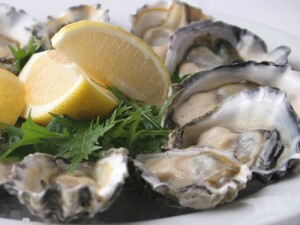 Wines with high sugar levels or fruity flavors can clash with iodine which is present in oysters. Common wines associated with oysters include Muscadet, Chablis, Quincy, reuilly, white Bordeaux, and white Coteaux du languedoc. Champagnes are also suitable for serving with oysters.